In this article I will explore how video content can increase SEO for your website. If a video is hosted on YouTube, how will that affect my SEO? What if I host it myself? What of the fabled ‘video is good for your SEO’ myth? Will video help you ascend the ranks of Google? How do you actually make that happen? The preferred and easiest route for a video to take onto your website is to host it on YouTube and / or Vimeo, then embed that link into your website – rather than hosting it yourself. Hosting it yourself means creating various different versions to playback on different screen sizes, and various versions for different browsers. YouTube is a nice and easy option, but does Google link that video to your site? Can you get the benefit of improved SEO, and use YouTube? Ultimately, how does Google know that your video is indeed yours? Or can I just embed anyone else’s video from YouTube and help my SEO that way? There are very strong arguments to hosting the video yourself over hosting on YouTube, and this splits the marketing community. Will mean people link directly to your domain when quoting your video (so make it good, otherwise why link to it at all? ), rather than to YouTube. Can lead to a Video Rich snippet in the search result. These are the descriptions under each search result, some of which contain a video thumbnail. But 92% of these regular search snippets are dedicated to Google partner in crime, YouTube, the only other mildly ‘significant’ players being Daily Motion and Vimeo; and overall numbers have been cut significantly in recent years. These days, video rich snippets on the regular Google search appear to be populated solely by YouTube, it’s only on the video search age where others might get a look in. The main point being though, is that by hosting it yourself your website gains the SEO benefits of the new video, and they are not lost on YouTube. That’s right, host it on YouTube and the direct SEO benefits are ‘gone’. The question is though, on balance, how much does that matter? Site Speed. 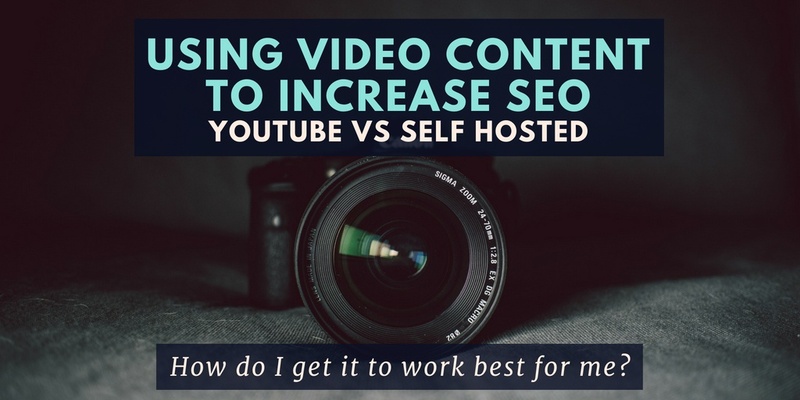 Yes, hosting video on your own site will certainly boost your SEO, but it’ll slow down your server, especially if you have any number of potential customers browsing at one time. In the distant future limitless data will no doubt be streamed or downloaded instantaneously, but we are not quite there yet! No matter how far we have come in the last 20 years. Be aware, embedding a self-hosted video link will not slow your site down as such, for example it may well just open a new page. It will only cause an effect if multiple people try to stream it, pushing your server’s bandwidth. How much does hosting video yourself actually slow your site down? YouTube does all the compression, versioning and compatibility juggling for you. And believe me, there’s a lot of it. Do you really want to do the following every time you add a video…? Install a video player on your website, such as com. WordPress, however, can host video natively. You can write and upload an accompanying video transcript to help Google. Definitely provide a video sitemap, which is an extension of the regular sitemap. This involves adding the required Shema.org code to your page, and submitting the XML sitemap within Google’s Webmaster Tools. So, hosting it yourself if no easy task, all to mine that SEO gold, so let’s take a look at the benefits of hosting your video on YouTube. A billion hoursof video is consumed on YouTube every single day. Add a link to your site in the description. This is very important, here is a free backlink, use it! Careful with the name, make sure it is something that will stand out, and that the keywords are carefully chosen to reflect what people might be searching for in relation to your product or business. ‘Do the added IT complications of self-hosting outweigh the SEO benefits of having a video uniquely hosted on your site? For most, it is a ‘no’, and hosting on YouTube will suit you just fine, especially when considering all the added exposure it can bring. In fact, the trend (admittedly this graph is from 2014!) is to host video on both your own and third party platforms, and most SEO professionals would recommend doing so. You can for example gain huge numbers of likes and exposure on Facebook. Our video for a small, local, kids’ party company, Enchanted Events, gained 7.6k Facebook views on their page. That’s a lot of exposure, and a video on Facebook gets 135% more engagement than a photo. There’s a strong correlation between higher shares on social media and higher positions in the SERPs (Search Engine Results Pages). It’s not just Facebook of course, the likes of Twitter and Instagram are a must. Social Media posts can also drive traffic to your website, maybe by offering a discount code, or to see further or more in depth videos, or find other resources and information. Hosting on YouTube only will not directly improve your personal SEO, and there is no magic way to do this. What you can do is add your own backlink to the YouTube description. But the exposure on YouTube could be just as beneficial, essentially by using YouTube as the search engine instead of Google. It’s far, far easier to get YouTube to do it, which counts for a lot if you are regularly uploading videos. Even if you do host externally, upload a copy of your video on your site yourself. We have a Vimeo version and my own one on the home page, a half-way house to try to gain a bit of extra SEO, and also use Vimeo’s bandwidth. And if you use YouTube, don’t stop there. Either use it, or create shorter versions and put them on social media to drive traffic to your site from there. But ultimately, the only way to directly increase your SEO using video content is to host it yourself, and the easiest way to do that is via WordPress. Keep videos short. Or grab a viewer’s attention quickly – that is to say put your best stuff at the top of your video. A study released this year from Microsoft revealed that people have shorter attention spans than goldfish: eight seconds! Quality not quantity. The higher the quality, the longer people will watch for, and the better chance you have to convey your message, set yourself apart, and demonstrate your quality. A better video will also get more links, and more exposure on YouTube. If you would like to provide feedback, if there is anything I have missed, or even get a quote for a video production job, feel free to get in touch.